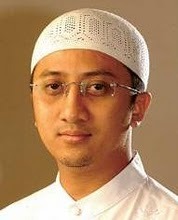 Uztadz Yusuf Mansur was born December 19, 1976 in Jakarta, from an affluent family Betawi couple Pulpit and Humrif'ah Abdurrahman and his parents are very spoiled. The best graduates of Madrasah Aliyah Negeri 1 Grogol, West Jakarta, in 1992, was once studying Informatics but stopped halfway through because it is more like motor racing. In 1996, he plunged in Informatics business. Unfortunately his business even cause a number of his billions in debt. Debt because of that, the feat Yusuf felt the cold hotel without cost for 2 months. After his release, Joseph returned Ustadz trying to do business but it failed again and again in debt. The wrong way of life brought back to jail Yusuf feat in 1998. While in prison then, Ustadz Joseph found wisdom about shodaqoh. Post-prison, Joseph Ustadz sell ice in the Kali Deres terminal. Sincere thanks to the charity anyway, eventually evolving business Yusuf feat. No longer sold with a thermos, but use a cart, he also began to have men. Joseph Ustadz life began to change when he met police who introduced him to the NGOs. During work on the NGO's, Ustadz Yusuf makes the book Finding God's Love Holidays Lost. Books inspired by his experiences in prison as long as their parents. Unexpectedly, the book received overwhelming response. Chaplain Joseph frequently invited to the book review. From here, the invitation to speak from her. In many lectures, he always emphasizes the meaning behind the charity by giving examples of real-life stories. Yusuf feat more glossy career after meeting with Yusuf Ibrahim, Producer of PT Virgo Ramayana Record label with the launch of Kun Faya Kun Tausiah tapes, The Power of Giving and Family. Similarly the concept of charity that he entered the art world role. Through the loving heart, which worked together SinemArt week, he called the virtue of charity through the impressions that are based on a true story. Cleric Yusuf is also working on a film called KUN FA YAKUUN who starred with Zaskia Adya Mecca, Agus Kuncoro, and Desy Ratnasari. This film is a final project of the roadshow events (lecture tour) titled the same as during January-April 2008. Travel through the heart, it provides SMS services Kun Fayakuun to find answers to existing problems. He also initiated the Breeding Program penghafal Al Quran (PPA), a flagship program and a laboratory for the whole family charity Wisatahati. Donation of PPA used to print the Koran penghafal through free education for orphans Boarding Daarul Wisatahati Quran. Although no time to finish college, Ustadz Joseph and two friends founded the college of Computer Science College of Human Settlements Information. Joseph was married to Siti Ustadz Maemunah and has been blessed with three children.